No sushi meal is complete without a portion of wasabi. This condiment is made of the stem of the so called Eutrema Japonicum. Most people simply call it wasabi or the wasabi plant. Wasabi is also called Japanese horseradish, but horseradish is a different plant, although related to to wasabi. The wasabi plant originally grows along stream beds in mountain river valleys in Japan, but these days the plant is also cultivated in a few places outside Japan. Nevertheless, because they are hard to masss produce, real wasabi is quite expensive. Often it is replaced by a pungent mixture of horseradish, mustard, starch and food coloring. Click here to watch Chef Devaux explain how to make the real wasabi condiment, including more info from the Chef about wasabi and links to a few wasabi suppliers in the USA and Europe. If you have a bit of patience and perhaps ‘green fingers’, it’s worthwhile to try and grow your own wasabi. Cultivation takes at least 1.5 years, but it’s better to let the plant grow for 2 to 3 years. Be aware that wasabi plants are hard to cultivate. The upside: the experience of enjoying your own homegrown wasabi is incredibly satisfying. Fresh wasabi loses its flavor really fast, after 15 minutes the flavor starts to go. Therefore its best to prepare the wasabi right before serving the sushi. 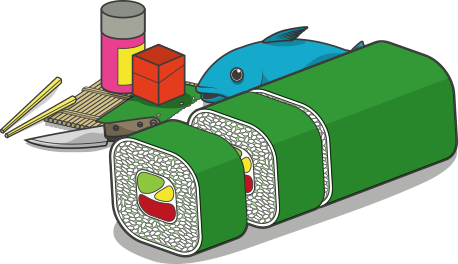 Covering the wasabi preserves the flavor, that’s why the wasabi is often put between the fish and the rice. But if you serve it separately in a ramekin, that’s sufficient as well. After all, it’s not like the flavour disappears completely after 15 minutes. But it does deteriorate. Wasabi is not only used because of its flavor. Real wasabi also disinfects raw fish, and it reduces the smell of the fish. All in all more good reason to use real wasabi! A lot of people mix the wasabi with soy sauce and use the result as a dipping sauce for the sushi. To some that’s a mortal sin. Others don’t care one way or the other. The most important thing is of course that you enjoy your food, but it is a fact that mixing wasabi and soy sauce destroys the taste of the wasabi and the taste of the soy sauce. That’s not really a problem when it’s fake wasabi or run of the mill supermarket soy sauce. But when you’re using real wasabi and quality soy sauce, Chef Devaux recommends not mixing the two. If you still feel the need to combine the taste of wasabi and soy sauce, put a bit wasabi on one side of the sushi roll, dip the other side in a bit of soy sauce and let the tastes come together in your mouth.